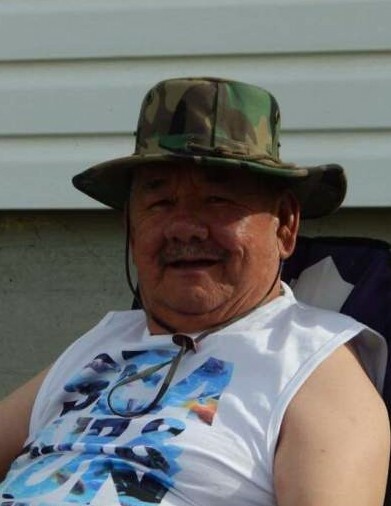 With heavy hearts his family announces the sudden passing of Christopher at the age of 69 on Saturday September 29th, 2018 while doing his traditional hunting north of Cochrane. He will be deeply missed by his wife Gloria Iserhoff (nee MacDonald), his daughters Lydia Iserhoff and Sherry Iserhoff, his son-in-laws Serge Couture, Conrad Wesley and his grandchildren Kerrigan Iserhoff, Myriah Iserhoff, Bethanie Iserhoff, Tori Iserhoff, Sandy Couture and Ethan Iserhoff. He was the brother of the late Billy Iserhoff, the late Frederick Iserhoff, the late Thomas Iserhoff, John Iserhoff, the late Lillian Turgeon, the late Annie Hookimaw, the late Laura Wabano, the late Susan Sackaney, the late Louise Chakasim, the late Linda Iserhoff, the late Richard Iserhoff and many nieces, nephews, other relatives and friends. He is also predeceased by his mother Hannah Iserhoff (nee Erless) and his father Thomas Iserhoff. The family will receive friends and family on Thursday, October 4th, 2018 staring at 7pm at the Pentecostal church. The funeral service will take place Moosonee arena on Friday October 5th, 2018 at 11 am followed by the burial at the Moosonee Cemetery.